Learn how to sign up, connect, and configure your Xero add-on. Before connecting to Xero, your account must include the Xero add-on, which can be enabled by your account owner on the Subscription page within Account & Billing settings. Once you've done that, click the Integrations menu item. Select the Xero tab along the top of the Integrations page, and click the Connect to Xero button. You'll need to sign in to Xero if you aren't already. 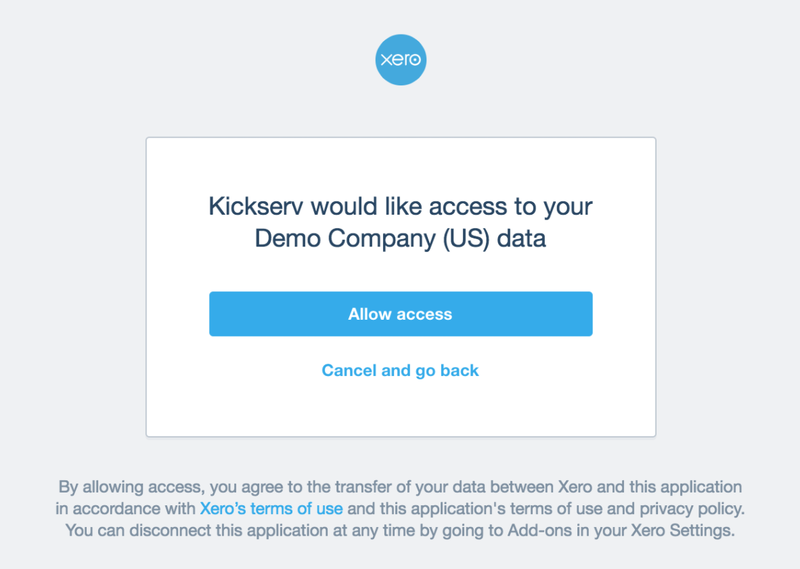 Xero will ask you to allow Kickserv to access your data. Once you've allowed access, you'll see some Xero configuration options. These options are required before your first sync. Address fields: Service address can be synced to a Xero contact’s postal or street address. Billing address can be synced to a Xero contact’s postal or street address. You can choose which goes to which. Invoice tax type: Kickserv will always display line items exclusive of tax--meaning the total tax amount will be shown in the Totals area. This setting must match the corresponding setting in Xero so that tax and item amounts will sync properly. Default line item account: Line items on your invoices will be assigned by default to the Xero account you choose here. You can choose from your Xero accounts that are of type Revenue. Default payment account: Payments will accrue by default to the Xero account you choose here. You can choose from your Xero accounts that are of type Bank or have Enable payments to account set. Invoice due date: This option allows you to set how far in the future new invoices are due. You may select between days and months.